Thanks for the rocking horse plans!!! Story, lets see... I am a dad-to-be in a few months and wanted to make something for my son. I have a little experience with wood but nothing detailed. Basically just shelves and framing. 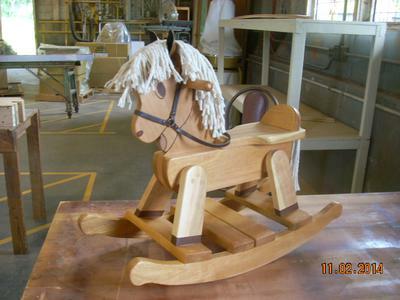 Having access to a complete woodshop, I had decided to build a kids chair but then thought of a rocking horse. 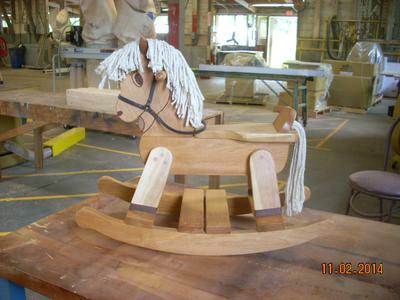 I did a quick search and was lucky enough to come across the free rocking horse plans you have on the site. I read through and decided that was my new project. I can't thank you enough!! I chose to use cherry and maple. Ended up adding personal touches but could not have done this without your plans. I have attached a couple pics of the finished rocking horse.